Ironwood statue outside the old railroad station and history museum. Ironwood has a rich history of mining and the timber industry. By the turn of the century (1900) there were 6 iron ore mines operating in the Ironwood area. By 1920 there were almost 16,000 residents in Ironwood. 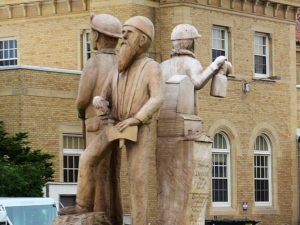 With the conclusion of the logging era and the decline of mining (Ironwood’s last mine closed in 1965) population has declined to a little over 5,000 residents. While tourism (in the summer to nearby Black River Harbor Scenic Rec Area and Porcupine Mountains Wilderness Park and winter to the area’s four downhill ski areas) is now Ironwood’s main industry, a rising star is the Stormy Kromer & Jacquart Industries facility providing good paying jobs and a fascinating factory tour. The original Stormy Kromer hat. 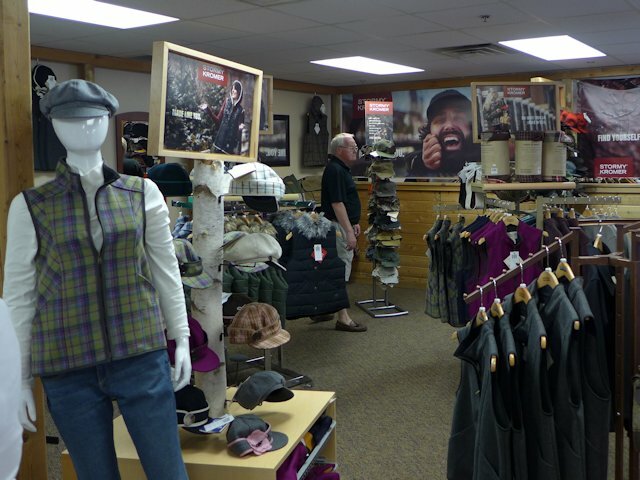 The factory showroom with a variety of the Stormy Kromer “Made in America” apparel products. In June of 2015 we joined about thirty other Ironwood tourist in taking the factory tour. While the famous Stormy Kromer hat is the centerpiece of the facility, being produced in a wide variety of colors and patterns, we discovered the Kromer production facility also makes a wide variety of other apparel products, some of which are private label products for other merchandisers like LL Bean and Cabelas. 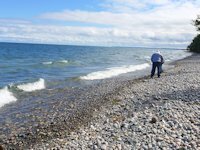 Apparel made in America and in the UP; how great that is. 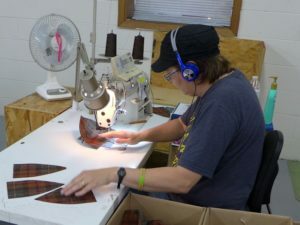 In addition to their expanding line of outdoor apparel, Stormy Kromer has other manufacturing stations making other goods. One of which were a line of doggy beds being produced as a private label brand. Another station makes fishing rod holders for St. Croix Industries. 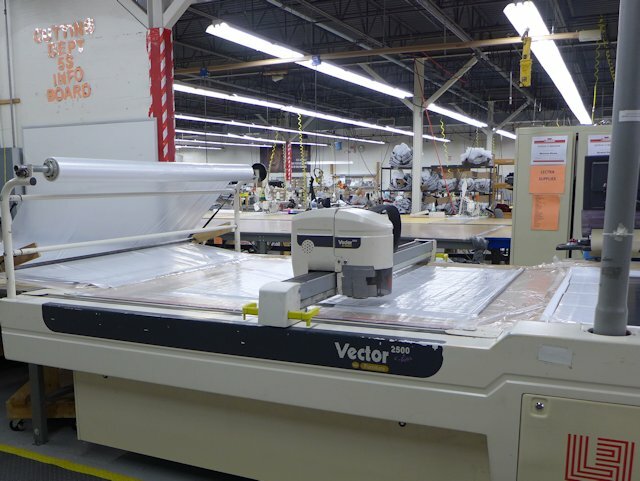 At other stations, embroidery machines are creating custom designs and logos for other products. 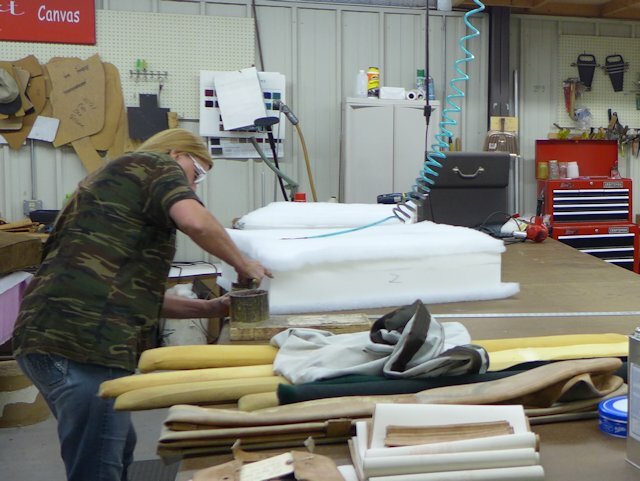 There’s even a custom re-upholstery unit where during our visit a worker was creating new seat cushions for someone’s boat. Yooper ingenuity at work. They have to machines, manufacturing space and people who want to work – so they find ways to put these resources to productive and profitable use. Information on ordering The Original Stormy Kromer Wool Cap and other models, in men’s and women’s sizes and styles. The beanie part of the hat is formed by 6 triangular pieces sewn together. This group is working on Stormy Kromer vests. The historic Kromer hat originated in 1903 designed by a railroad engineer (Stormy) and his wife. In those days safely operating a steam locomotive required the engineer to frequently stick his head out the window to see the tracks ahead. During the winter, especially, a hat was needed to avoid turning your head into an icicle. After having several hats blown off his head, Stormy asked his wife Ida to sew some flaps on his baseball cap to keep it on his head. Eventually, Ida modified the design that included a shorter brim along with the ear flaps. Other engineers began ordering these strange, but functional hats from Ida. 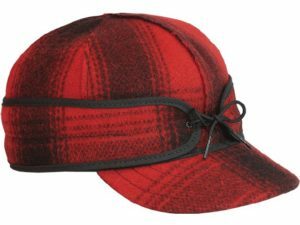 Other outdoor workers joined in and by 1920 Stormy Kromer Mercantile was producing the hats in a modern facility in Milwaukee run by Stormy himself and later by his children. By the year 2000 however demand for the classic hat had fallen quite a bit and Stormy’s heirs lacked the interest in continuing the business. Bob Jacquart heard about the plans to cease manufacturing and saw an opportunity to rescue an icon. 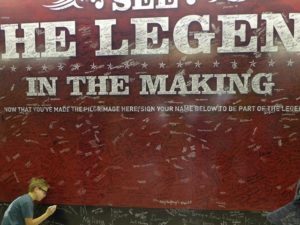 That he did and in the process created jobs and started a new line of outdoor clothing made right here in Ironwood, Michigan. Factory Tours are available Monday – Friday at 1:30 pm, Central Time. 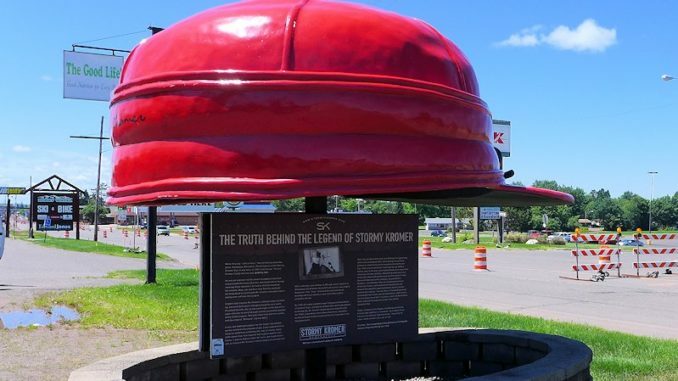 Each tour is escorted by a Stormy Kromer employee and generally lasts about 45 minutes. The tours end at the company store where there is an extensive offering of Kromer products and also a bargain nook of factory seconds or discontinued designs. 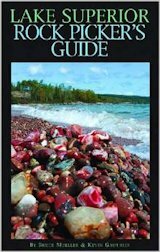 An entertaining and interesting tour for people of all ages, including kids. They make an especial effort to keep kids interested with hands on stuff. One of several computer controlled machines used in the manufacturing process. Boat cushions being re-manufactured at this work station. Alex Andrews learns to tie the ear flaps on the Stormy Kromer cap. 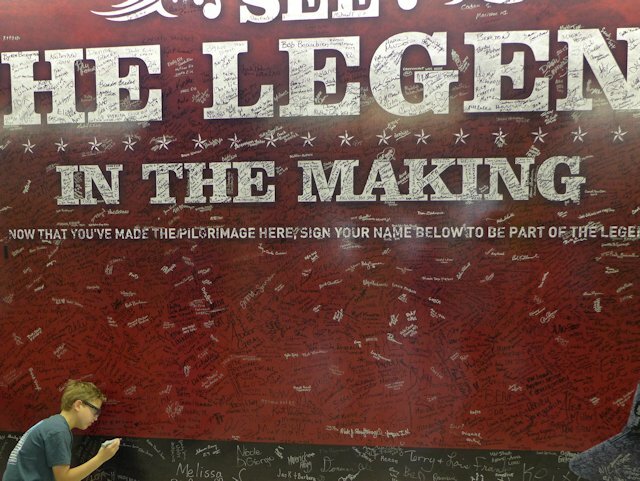 Alex signs his name on the Stormy Kromer Legends wall board.